"I'm just not feeling it, I don't feel Him. I'm just going through the motions in quiet time. My mind wanders and my heart just feels empty." I remember saying these words to friends as I explained the season of spiritual drought I believed myself to be experiencing. I just couldn't "feel God" and it was becoming very discouraging. I was frustrated because just a month before, quiet time was enlightening, enriching, powerful, almost supernatural and now... crickets. So what changed? That was my question to God. Oh how much I wish I didn't ask that question lol (be prepared for a real deal answer from the Lord) ... but I did and I believe He told me exactly what had happened. You see there was a time when I didn't hear from God, I didn't have life transforming revelations and conversations with Him. I distinctly remember crying out in quiet time saying "I'm your daughter! I love you with all my heart. Why won't you talk to me?" I was devastated and inwardly jealous every time someone would speak of sweet moments of intimate conversation, confirmation, and revelation from God. I practically tattooed Jeremiah 29:13 and Matthew 7:7 on my heart and kept reciting these scriptures back to God. I sought Him relentlessly every single day. Prayer first thing in the morning, sermons and gospel all day at work, quiet time in the evening, another prayer right before bed, and then I'd fall asleep to a sermon in my ear. I was so hungry for His presence. And just like the good good Father that He is, He heard my cry and delivered. He not only spoke to me but He revealed my purpose which I had been seeking for like ever lol. I began to have dreams that literally answered questions I had asked in prayer. I was given discernment and wisdom from God to speak to people about things I should not have even known about their circumstances. I don't share about this particular season of my life to boast, oh on the contrary. I share it because this is what I saw flash through my mind when I asked God why things had changed. He helped me to see that He was still the same, but that I had changed, that He was still in the same place but that I had in fact moved. And as hurtful and plain ol’ salty as I was to hear this painful revelation, He was sooo right. Yes I'd still have quiet time, still listen to sermons and what have you, but it was different. I was different, not as hungry, and not as desperate for His presence like before. I basically started to get lazy and more lax in my prayer life. I began to take for granted the very thing I begged Him for and His period of silence helped me to remember how much of a true gift it is to experience His glory and sweet presence. Needless to say, I had to go back to the basics. I needed to rediscover the joy of the Lord and “taste and see that the Lord is good” (Psalm 34:8). I realized that I needed to stay intentional about prayer and seeking God like He’s never revealed anything to me before. I want to be clear that not every time you feel that God is silent, is it because you’ve done something or in my case stopped doing something. The old quote sticks out in my head as I type, “The teacher is always silent during the test”. So somebody out here reading this just might be in the place that I was before God had ever spoken to me (or before I could discern His voice because He speaks to ALL of His children). You’re in the middle of a test and God is with you but not allowing you to know the answer to your questions or receive the blessings you seek, just yet. Sometimes God is silent simply so you will go deeper in your relationship with Him and develop a discipline that enriches your spiritual life while bringing glory to God. The spiritual desert is what is pruning, purging, and preparing you, its allowing you to build strength and endurance (James 1:2-3). 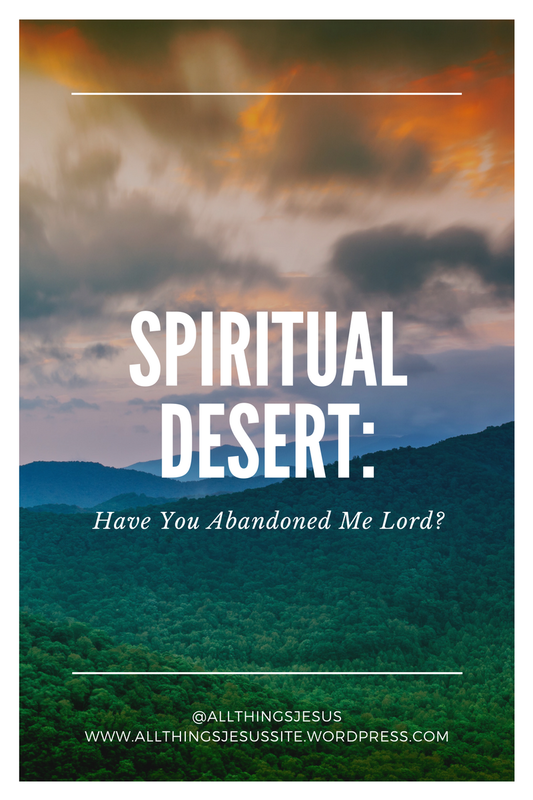 However, if you are in a spiritual desert right now and you know it’s because you moved from God, go back to where you first found Him. Pray more fervently than ever before, read the Word, watch sermons, listen to worship music… whatever it is that you need to do, just do it! The enemy seeks to destroy us when our guards are down, when we feel hopeless, and when we feel alone. Love you guys! Until next time, whatever you do, do it all for the glory of God.